London from Southwark. Oil on wood. 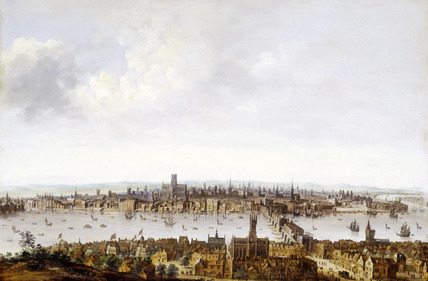 This is a view of London taken from Southwark in the mid-1600s before the Great Fire. It shows Southwark in the foreground, with the playhouses on the left-hand side and the cathedral in the centre. London Bridge spans the river and then the City of London itself is on the north bank of the Thames, shown as a huddle of crowded, narrow houses and church spires. The writer John Evelyn described London as 'this Glorious and Antient City…so full of Stink and Darknesse' in his Fumifugium of 1661. He went on to call the buildings 'such a Congestion of mishapen and extravagant Houses'. This 'congestion' of houses and industries belched out huge amounts of smoke into the atmosphere and created a massive fire risk. The Great Fire of London was an accident waiting to happen.